As a former U.S. Army specialist who served everywhere from South Korea to North Carolina, Erci Moisa got used to jumping from airplanes in the wee hours before dawn. And though the rigors of earning an MBA might sound far less frightening, Moisa said it was still intimidating making that leap of faith toward his advanced degree. "I didn't know what to expect or what I'd get out of the MBA," said Moisa, who graduated from Florida Atlantic University's Financial Analyst program and earned his Executive MBA here. "Looking back, I can see that it was perfect. Two to three years ago I was working in a completely unrelated field. Now I have a skill set that allowed me to transfer." Moisa isn't alone in that assessment. In May, U.S. News & World Report ranked Florida Atlantic University's online business graduate program among the nation's Top 40 for veterans. As Moisa pointed out, veterans who negotiate a graduate business program bring to the task a brand of grit that makes them ideal candidates to succeed — a quality that they can share with their classmates. "What I liked about the EMBA program at FAU was that it was somewhat similar to the military," he said. "The strongest or the smartest are not always going to finish. In reality, it's the people who are really determined to do the program, who are team oriented — which is a concept you learn in the Army. And that was the thing that helped me out the most." Yet veterans making the adjustment back to civilian life often need assistance in helping them to go that extra mile, just as they did in the armed services ... or in some cases combat. "Some have been through hellish situations, while many have been through merely tough experiences," said Daniel M. Gropper, FAU's dean at the College of Business. "They sacrificed a lot for their country and we feel strongly about providing the support they need to define their career objectives — which builds on their experience and helps them to open doors." Those open doors can lead to some obstacles as well. Many veterans don't know how to maximize their resources and connections, for example. 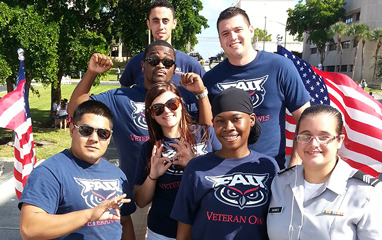 To that end, FAU goes above and beyond in its efforts to help its veteran student populace. "Our students don't have to run around campus trying to get registered or buy textbooks, we do all that for them. And our students know: if you need help, you call us," said Vegar Wiik, executive director of executive programs at FAU's College of Business. "Our coordinators have cell phones and you can get a hold of them after hours. We handle the registrations and we have an open door policy where you can come in to our offices and get help from day one. Your focus is on studying and to get an education — and everything else is taken care of by the staff." What's more, no two vets are alike, and that rules out any sort of rubber-stamp approach. "Some come from an IT background and want to pursue that direction in the civilian sector, while others want to do something completely different, such as follow a marketing track or enter financial services," Gropper said. Still he sees a consistency that makes alumni such as Moisa so special: "We find the discipline they've earned is a big plus: the ability to work as a team and under a lot of pressure toward a common goal," he said. "These are things employers definitely look for. If they can work under gunfire or to rebuild a bridge as part of a team, then they can handle the pressure of turning in a consulting report by noon. It's not going to rattle those young men and women." In 2014, the number of military members taking the GMAT increased by more than 20% over 2013, according to Poets & Quants. And in 2013 and 2014, roughly 11% of students in the 141 online bachelor's programs that responded to a U.S. News annual survey were either veterans or members of the military. That said, veterans pursuing business degrees will of course leave behind certain specialized skills. In his new job in healthcare finance, Moisa doesn't have to parachute into work at 2 a.m. But there's another kind of deep dive he has to face every day. "I've learned to live by my Excel spreadsheet," he said. "It's always open."